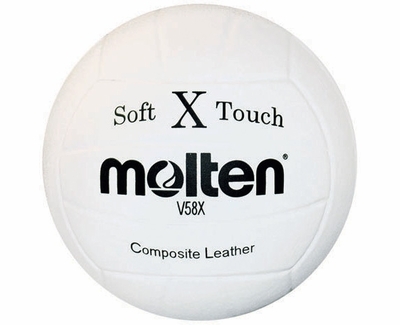 This White Soft-Touch V58X Molten Brand Volleyball is a great Training ball at an affordable price. Molten's Soft X Touch Volleyballs feature a soft micro-fiber composite cover and nylon wound Uni-bladder core. Official Size and Weight. This Micro-Fiber Composite Leather Soft Touch X Molten Volleyball is available in the Color: White. PLEASE NOTE: Volleyballs are not shipped fully inflated, so you will need an air pump to inflate them to the proper level. Coupon offers are not valid on Volleyball purchases. Some shipments may require additional charges.